Last week I showed you the antique ledgers/diaries I purchased at the indoor flea market. I also picked up a small flow blue bowl, tiny teacup and a pretty porcelain plate. But right after that I had to take young Mr. VJIMT to a school function, which I didn't mind so much as there is a Goodwill right across the street. I found this vintage Goebel porcelain raccoon figurine there in perfect condition. Also this bag of goodies. I could only see the deer, but that's all that I wanted! Everyone else did too, as they kept oohing and aahing over the bag in my cart. Next I stopped at an estate sale that had started at 8am. Only now it was after 1pm and I was surprised to find a line still waiting to get in! Sadly, I did not come home with this typewriter; it was priced at $200! But I did come home with this pretty ironstone pedestal compote. It did not stay home with me for long though, as I listed it on Etsy (and the Mustard Seed Pages) where it sold practically overnight. I couldn't leave this charming colored phototgraph behind. Or this one. I've seen people alter them for Halloween. What do you think? Speaking of the holiday season, you knew I would find Christmas in there, right? This appliqued felt tree skirt (or small table covering) is the epitome of kitsch. I found a similar looking snowman one here, which I used last Christmas. This one is going to the Etsy Christmas Junk shop. And check out these sweet vintage Christmas stockings. Love the Lulu! Lesson of the day -- it's never too late to find a treasure! Speaking of Christmas, I opened a new Etsy shop dedicated solely to that wonderful time of year (which is less than 4 months away)! Welcome to Vintage Christmas Junk in My Trunk! I only have about ten items listed so far, but I have plenty of inventory! The last couple of days were spent just sorting through my hoard of ornaments. Most of these were purchased with the intent to make vintage ornament wreaths -- I'm sure you've seen the fabulous ones by Suzy (Georgia Peachez) -- which I have not yet attempted. But I think I have enough to get started, right? There are some "special" boxes that I've listed for sale. As well as special chenille angels. And special elves, already sold! It's a little bit more work, but I think it will be good to have a shop devoted entirely to vintage Christmas. I wish Esty would allow you to edit two shops simultaneously, link to the same Facebook page, and transfer items between shops, but this is the way it works right now. 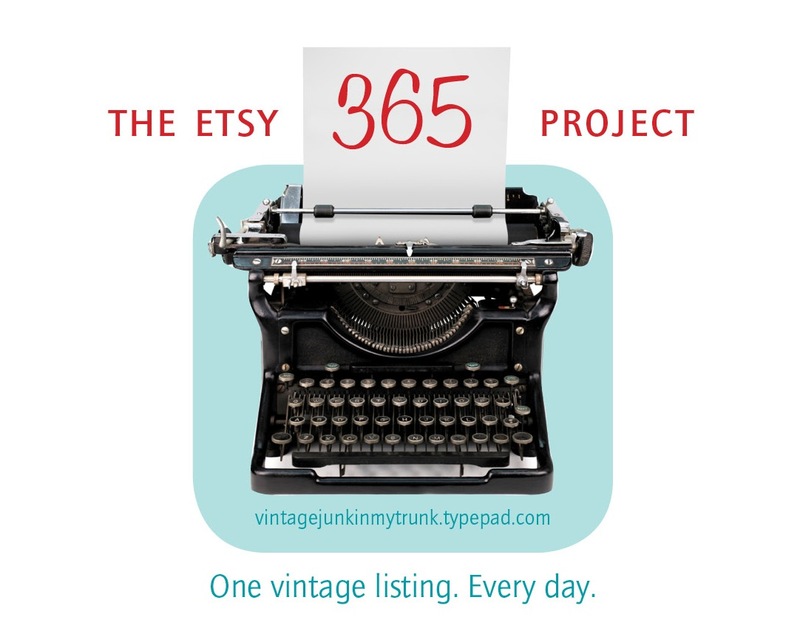 I may need to add an additional Christmas listing to the Etsy 365 Project. What do you think? 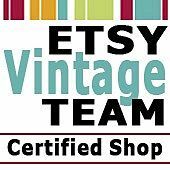 Head on over and favorite me if you're an Etsy shopper. Facebook "Like" and blog reader discount applies to all purchases! There's been no junking here for two weeks. Sigh. Winter is so depressing. A neighborhood indoor porch sale looked promising. I was very excited to find these vintage plastic reindeer lawn decorations. Santa in his sleigh is missing, as well as whatever roping went through the holes in the stakes, and some of the deer have broken antlers, but I still think they're pretty cool! As is this celluloid snowman piece. He is hollow on the inside, and was originally part of a revolving music box. Only I think he looks more fetching as a light cover. Next stop was a church's small thrift shop's monthly sale. I just missed a box of striped Shiny Brites, but at least I managed to snag these. …and I wanted to replace it for Christmas. I got lucky and found the exact same bowl here in Pyrex heaven, and at 25% off! There were also boxes and boxes of Shiny Brite teardrop ornaments, in many colors. Mr. VJIMT got me a couple of boxes of the pink for Christmas! I also found this sweet garland of silver bells for $3. I may have to rethink my antique store moratorium! We spent more time inside that house on Saturday than we had originally planned on, so I had no fantasies that the Vintage Aluminum Christmas Tree from the 1960s would still be at the other sale, since it was well after 10:30 by the time we arrived. Luna was surprised as well. Yep, the 4-foot Vintage Aluminum Christmas Tree from the 1960s was still there. So I bought it. And its original box. Even though it is dwarfed by the bigger one I found last fall. Stella seems to like it. This would have made a nice Christmas card if my son's bare foot wasn't in the background. You know what else was still there? They are selling for upwards of $150 on ebay. I thought about keeping it for about two seconds, but I kind of like my aluminum tree silver and sparkly. I'm plain that way. Plus I still have the Vintage Rotating Motorized Color Wheel I found last year, so I listed it in my ebay shop. Because how many Vintage Aluminum Christmas Trees from the 1960s and corresponding Vintage Rotating Motorized Color Wheels can one own? December on the East Coast doesn't usually have much in the way of yard sales, so you take what you can get, and hope for the best. Saturday's listings featured a grand total of TWO indoor sales. One promised a Vintage Aluminum Christmas Tree from the 1960s, which I really wanted to take a look at, but the sale didn't start until 10am. The other sale had started the day before, which I had somehow missed. Too much prednisone? Anyway, not expecting much, we headed to the second sale with plenty of time to get back to the first to check out that tree. Imagine our surprise when we found the tiny house still PACKED with treasures. And crazy affordable too. Vintage Christmas ornament clusters! They weren't found in the suitcase, but fit inside nicely for transportation. Lots of framed prints and paintings. Love the details on this print. Mr. VJIMT scored some paintings. This frame will be converted to a chalkboard. This antique print went right into my Etsy shop. Very Botticelli-esque, I think. Oh, yeah, we found these there too. So far September has been fantastic with two back-to-back big yard sale weekends. This week did get away from me though and although I posted some finds on my Facebook page, I neglected to blog about last weekend's treasures. So let's catch up! Last Friday we went to an estate sale -- I love when they start on Fridays, which doesn't seem to happen too often around here. Fortunately, it was right in front of the house and AAA came and fixed it within 10 minutes! So I barely missed any shopping time. But this is all I got -- a series of vintage green Mary Jane books written by Clara Ingram Judson. And this very lovely illustrated Jolly Surprise Story Book. I'm going to skip right to Sunday, where we found an unexpected yard sale, this lovely French enamelware pitcher, and a little blue New Testament. And vintage Christmas foil wreaths! And finally, these gorgeous folding wooden stadium seats. Aren't they fabulous? I'm definitely bringing them to the show I'm doing next month. Saturday's finds coming up next. Bouckville 2012 -- Christmas Again? My apologies to those readers who are not fans of the vintage Christmas. Because yes, I found more, and of course, I'm going to show you what I got! On our way out of Bouckville at the end of the week, we ran across several barn sales in the surrounding small towns. The yard sale prices made it that much more fun! For example, I found all of these items while rummaging around in a big old dusty barn. The entire bag's worth cost me three dollars! Sequined red felt bird ornament. And, best of all, 2 strands of mercury glass bead garlands. Next time I'll be looking for more barn sales!